In 1996, Atlanta hosted the inaugural Olympic mountain bike event where Bart Brentjens and Paola Pezzo won gold. That same year, locals in Atlanta suburb, Roswell, began creating freeride-style trails and features. Miles of XC trails also existed, but in 2001, the City of Roswell purchased the 165-acre parcel to make everything legitimate. Urban bike park, Big Creek, was born. The City partnered with IMBA/SORBA Chapter Roswell-Alpharetta Mountain Bike Org (RAMBO) to build and maintain the trail system. Since then, more than seven miles of XC trails, a network of gravity-fed freeride trails and dirt jumps, and the trail head for the 6.5 mile multi-use greenway have been added. Big Creek Park is the only freeride area in the state of Georgia. The Quick Six is just that. Six short, but fast, downhill-focused stages, which is ideal for spectators to see all the action on each stage. Racers alternate between the downhill sections of the park’s XC trails and the freeride trails. Special one-day-only race lines are cut on the XC trails to amplify the downhill terrain. Unlike the EWS, there isn’t a time requirement to be at the next stage, which leads to a more relaxed vibe to the whole day. Shred. Chill. Repeat. This year’s event was the largest yet, reaching its cap of 150 riders well ahead of race day. The 80-degree temps and sunshine certainly played its part. The last two years, the race was affectionately known as the Sloppy Five (only five stages could be completed due to lightning) and Slippery Six (rain right up until race start). Expert Men was the battleground to watch. Chris Wyatt, a two-time event winner, was coming back from injury, but still super fast. Last year’s runner-up, Ben Hobbs (Joemoto Racing/Sunshine Cycles) used his motocross background to stay ultra-competitive in the freeride stages. Joe Karpus (MTBGarage.com), Ross Monckton (Sixes Pit Bikes), and Jesse Heard (HeroDirt/Fly Racing) were each taking top 3 spots on each stage throughout the day. While the guys are all good friends, the appropriate level of smack talk was definitely keeping things interesting. The final stage, Lunch Line, would prove to be the separator between first and second overall, with Ben Hobbs taking the win by one second over Chris Wyatt. Ross Monckton and Joe Karpus traded spots all day, with Ross taking the sixth stage by two seconds to secure his spot on the podium. Jesse’s stage one win was not enough to hold off the rest of the crew and scored fifth overall for the day. We’re thinking of getting the water tested in Athens, GA, because their crew of Terri Watts (Terrapin Beer Co.), Abby Hobbs (Ben’s sister), and Emily Cox (706 Project/Terrapin Beer Co.) were fast all day long. Terri held her own on five out of six stages, with Abby taking first on Stage Four, Honor Roll. Abby was also close on Stage Six just a second back, but finished 15 seconds behind Terri. Emily’s crash on stage 3 put second place out of reach, and she finished third on the day. 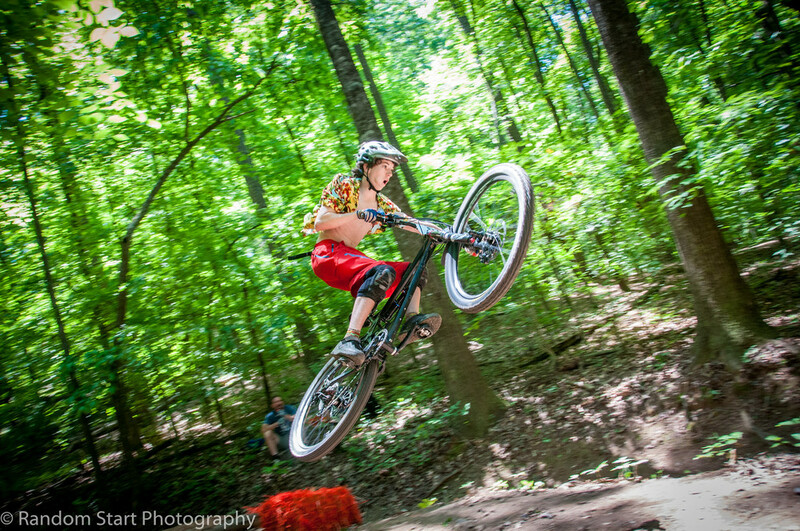 Another crew bringing the speed was from Blue Mountain Bikes in Blue Ridge, GA. Chase Key (Sport Men), River Key (Junior Men), and Michael Pate (Senior Men 40-49) all took the top podium step after crushing the competition. Next year’s event will feature team classes to see who really has the fastest squad. The RAMBO crew would like to thank all racers, volunteers, spectators, event sponsor Fresh Bike Service, and their supporters Atomik Carbon, Bell, Smith Optics, and SRAM/Rock Shox, race timing by 3rd Coast Enduro Series, Village Burger, the City of Roswell Parks Department, and IMBA/SORBA for their support to help raise funds that go right back into our local trails.